In retrospect its difficult to believe The Monkees were as popular as the Beatles for a couple of years. Mickey Dolenz, Peter Tork, Michael Nesmith, and Davey Jones had their own television show, 1966-1968, and used it as their springboard to massive success. They were basically a pop band who produced catchy songs. 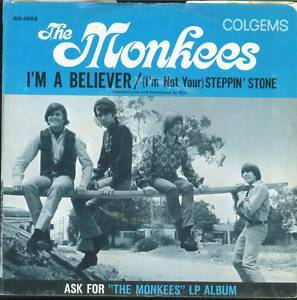 “I’m A Beliver” released December 10, 1966, would become their biggest hit spending seven weeks in the number one position on The American singles chart. The song was written by Neil Diamond and the lead vocal was by Mickey Dolenz. It remains the lightweight side of the late sixties and a sunny counterpoint to much of the music that was being produced at the time.